I forgot to set my alarm this morning and slept about 15 minutes later than I usually do. Feeling tired and knowing this late start would cut into my workout, I briefly considered skipping exercise altogether. Thankfully guilt prevailed and I ended up spending about 25 minutes on the elliptical. It was sufficient to raise my heart rate and make me sweat. Other than that I can't remember a thing about it. My racing plans have been on my mind lately. I'm still on the fence about whether I will do the RXR LI Marathon 10K the first weekend in May. I enjoy racing and I do believe it helps push me to higher levels of conditioning than I would reach were I solely a recreational runner. The thing is, I just raced a couple of weeks ago and I really just want to take a few weekends to get out and have fun on the roads and trails. It's different when preparing for a race where every run is about preparing to meet performance goals. On the other hand I've only competed in one 10K, a trail race, and I'm curious to see how I'd do in a road race at that distance. I did the LI Marathon 5K last year so the 10K would represent progress, or at least a new experience. I should be able to run 6.2 miles competitively right now without a lot of race-specific training. I have until Sunday to decide. That's when registration closes. 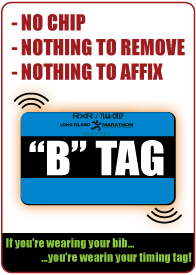 They have a new system where your race number is also your tracking tag. The geek in me is really intrigued by that. It may be enough to get me to the starting line. What ever decision you make, I am sure that it will be a good one nonetheless. Great job in working out today. I did learn from you a while back that you may not "feel" like running or working out, but later, you feel worse for not doing anything. In the bib? That does sound cool. I don't think that is enough to get me to a race, but hey, what the heck. Best wishes in whatever you do runner. Take care. I'm certain the tag has a passive RFID chip, same as they put in the tracking strips that you wrap into your laces. They probably position the reader higher to activate at chest or thigh level for the bib tags. The mat sensor works with high and low frequency passives that have shorter read ranges. I'm wondering what frequencies they use for these tags, probably 900+ MHZ.